One of my favorite episodic television series is back on the air tonight, so I thought it the appropriate time to delve into one part of Psych‘s appeal: it speaks to the postmodernist in me. 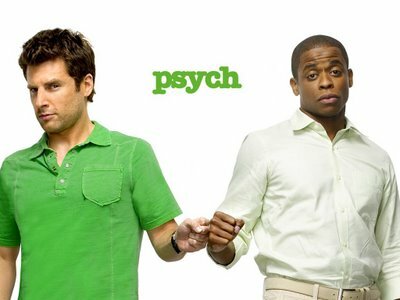 While far from perfect Psych boasts a number of strengths: the central friendship between Shawn Spencer (James Roday) and Burton “Gus” Guster (Dule Hill) is breezy but believable (as is Roday’s and Hill’s off-the-charts comedic chemistry); the supporting cast provide balance in the day-glo hyperreal world of the show; and some of the snappiest and most popular culture reference-laden dialogue on the air occurs at a pace that would sometimes make Aaron Sorkin jealous. Yet, the plots are ludicrous, especially the premise: for going on four years, Shawn has been able to fool both private clients and the Santa Barbara police department into believing he is psychic merely by his powers of observation. (Yes, The Mentalist basically stole the idea of this premise.) However, the show never takes itself–or anything–seriously. Witness the element that first made me tune back in: the Psych out. These outtakes played over the end credits of many of the early episodes and were often Roday and Hill singing and dancing their way into my heart. Jameson characterized the postmodern as being temporally schizophrenic. “With the breakdown of the signifying chain, therefore, the schizophrenic is reduced to an experience of pure material Signifiers, or in other words as a series of pure and unrelated presents in time.” In Psych, the 80s seem perpetually present, with Shawn and Gus continually making reference to 80s popular culture (as well as the pop culture of other decades and the present, but the 80s take the majority), with a special focus on the minutia of that cultural moment. The result is often that only Gus understands Shawn’s references and vice versa, as the references to cultural ephemera has become obscure with the passage of time. For Shawn and Gus, though, that past is perpetually present and available. (Shawn lives in a state of arrested development, often having to borrow his father’s truck and installing school lockers in his office, so for him, the 80s–as the formative years that he never matured beyond–are his present.) This is in part because of Psych‘s form as a pastiche of many 80s detective programs. Crockett and Tubbs or Spencer and Guster? The episodic nature of the form runs counter to the serial trend of some television post-Lost, and the light tone also separates Psych from its fellow closed-in-an-episode mysteries like the self-serious Law & Order and CSI franchises. Instead, the show appears in tone and plot more like Murder, She Wrote, Columbo, or MacGuyver. Moreover, both it’s blank parody of and myriad references to the 1980s are made with a clear lack of critical distance, as both elements rarely say anything about the characters or the show itself beyond their ability to make those references or embody that tone. The show is not commenting on the formula or tone of those 1980s detective predecessors, nor on those cultural works to which the characters refer. Even its most recent advertising campaign evokes the 80s for no discernible reason other than somehow fits a show that constructs itself from old forms, old styles, and old speech from “the imaginary museum” from which current cultural producers must turn. If you didn’t know anything about Psych before that ad, would you guess that its present context would be the 1980s? The point of all these references and this tone, though, is not a lofty expression of the postmodern moment. It evokes the 80s because they have taken on this day-glo sheen, shining bright and fun in the popular consciousness. Psych may be a postmodern program, but it lacks the dour notes of Jameson’s analysis of postmodernism. Instead, it takes the presence of the past and the lack of critical distance and owns it, accepting it as, perhaps, a cultural dominant, but insisting that there is still room for play. 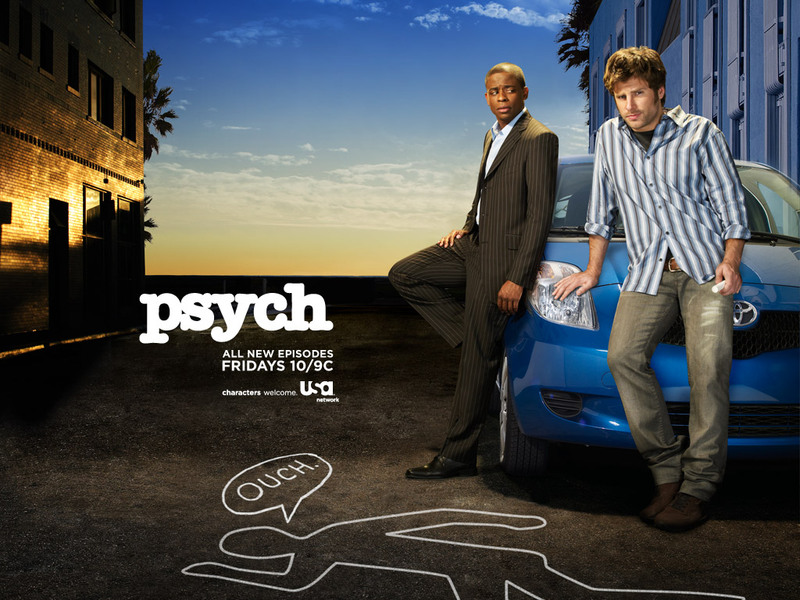 On Psych the characters can play dress-up in the clothes, speech, references, and tone of the 1980s–or the neon idea of the 80s–because it’s fun, and that’s all the reason the show needs. 1. I’m mostly using Frederic Jameson’s identifying features of postmodernism, though it should be noted, Jameson viewed postmodernism as a cultural dominant, not to be parsed out into attributes. 2. Jameson, “Postmodernism, or the Cultural Logic of Late Capitalism,” Media and Cultural Studies: Key Works, Eds. Durham and Kellner, (New York: Blackwell, 2006), 500.